PATRICK MIKHAIL GALLERY is pleased to announce AMY SCHISSEL has been awarded the prestigious 2016 Joan Mitchell Foundation Grant for Painters & Sculptors. 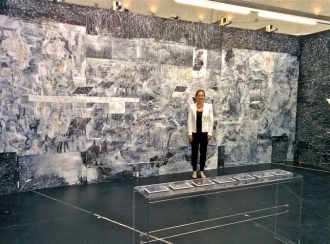 Schissel, an Assistant Professor of Painting at West Virginia University in Morgantown, was awarded the grant in January 2017 following a rigorous nomination and selection process that recognized her professional practice’s focus on analyzing the role of painting and drawing in the Information Age. Established in 1993 and headquartered in New York, the Joan Mitchell Foundation increases recognition of the work and life of pioneering abstract painter Joan Mitchell (1925-1992). The grant acknowledges painters and sculptors who are creating work of exceptional quality through unrestricted career support. We extend our sincerest congratulations to AMY SCHISSEL and invite you to learn more about her professional practice including the 2011 RBC Canadian Painting Competition, and solo presentations at Volta NY 2013, Volta 10 Basel, and Volta NY 2016. We also invite you to discover the meaningful work being done by the Joan Mitchell Foundation through its innovative and comprehensive artist programs, and through the Joan Mitchell Center in New Orleans.